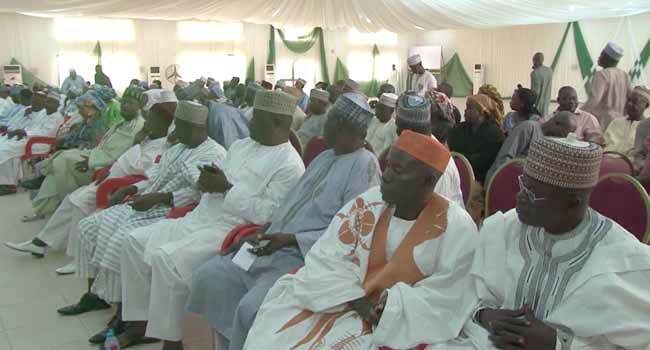 Members of the Adamawa State chapter of the All Progressives Congress (APC) on Tuesday. The All Progressives Congress (APC) in Adamawa State has adopted the Indirect Primaries for the election of its candidates for the 2019 General Elections. APC says the decision was reached after the State Executive Committee (SEC) held a meeting in Yola, the state capital. The Secretary to the Government of the Federation (SGF), Boss Mustapha, who is also a member of SEC, explains that the party’s constitution allows room for the adoption of indirect primaries. “Let me assure you that our constitution has adequately provided for three methods for the selection or nomination of candidates – either direct, indirect or by consensus,” he said on Tuesday. The SGF also appealed to party members not to create confusion within the party but to work together for its progress in line with the APC constitution. “Even when you decide that a candidate will emerge by consensus, the constitution went further to state that you will take a yes or no vote. Mustapha believes that despite its challenges, the ruling party is stronger in adversity ahead of the 2019 general elections. On his part, State Governor Bindo Jibrilla urged party members to join hands and ensure free and fair primaries. Speaking through his deputy, Martins Babale, the governor backed the resolution of party’s SEC to adopt the indirect primary in line with its constitution.